Kerrisdale Equipment have built a great team of professional, knowledgeable and friendly staff who work hard to give you highly competitive rates and a service that is second to none. Our team has over 50 years of experience dealing with the needs of both the homeowner and the professional contractor. We rent and sell a full compliment of contractor grade tools and equipment combined with a vast range of accessories We have everything you need including the know-how to help you get the job done right. 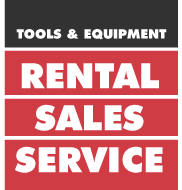 Whether you are looking to rent equipment or to buy from our vast range of products, accessories or consumables, you will experience the difference of dealing with a well-established, independent company, staffed by people passionate about delivering unbeatable service throughout the Lower Mainland to you, our valued customer, every time! Kerrisdale Equipment are a company that consistently stays ahead of the game for its customers by systematically searching out and delivering the highest quality, innovative products that, time and again, help get the job done better and more efficiently.